(Nature). 55 min. PBS. 2017. $24.99. ISBN 9781531703479. Gr 4 Up—Naledi's birth at an elephant sanctuary in Botswana is documented through amazing footage as her delighted guardians cheer her arrival. But, sadly, soon after this happy event, Naledi's mother dies, leaving the orphan with no source of food and almost certain death from starvation. As this heartfelt and emotionally gripping documentary states, the death of one baby elephant is a tragedy but the slaughter of thousands for the ivory trade is but a statistic. 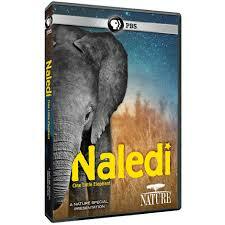 Naledi's caretakers work tirelessly to save her life while simultaneously documenting the 25,000 to 30,000 elephants killed by poachers in Africa each year. Naledi's first years are filled with drama, but she lives to become a beautiful, healthy member of her herd. Stunning photography and lush music add to the drama and make this a lesson in empathy and conservation. Elementary- and middle school—aged viewers will be absorbed by both. VERDICT Dramatic and emotionally gripping, the heroic efforts to save baby elephant Naledi are paired with related information concerning the massive loss of African elephants to ivory poachers. Valuable for discussions on conservation and animal life.